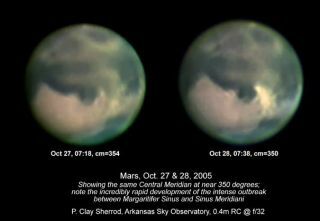 Mars on Oct. 27 and 28, 2005 as the dust storm emerged. A major dust storm has just broken out on Mars and the event will be visible this weekend with good-sized backyard telescopes. The timing is incredible. Amateur skywatchers around the world are planning to gaze at Mars Saturday night because it will be closer to Earth than anytime until the year 2018. The dust storm was no more than a small bright dot Thursday yet it was large and obvious Friday, as seen in images taken by Clay Sherrod at the Arkansas Sky Observatories. NASA took note and is monitoring signals from its Mars rovers, one of which has detected signs of the storm, SPACE.com has learned. The storm "will be quite obvious and plainly visible in even small telescopes from the Western Hemisphere for about the next week," Sherrod said in an email to colleagues that was forwarded to SPACE.com. The storm has seven appendages that stretch in all directions, Sherrod said. The overall cloud is about 700 to 800 miles across, according to estimates by longtime Mars-watcher Joel Warren, Sherrod said. Warren, of Amarillo, TX, told SPACE.com that he took the first image of the storm rotating into view early Friday using his 8-inch telescope. He notified Sherrod and others of its existence. The dusty cloud is spreading at a speed of about 35 mph and may become larger by the weekend. Dust storms are fairly common on Mars. Small storms have been known to swell and engulf the entire planet, as occurred in 2001. In 2003, Mars made the closest pass to Earth that had occurred for 60,000 years. This weekend, it won't be quite that close, but still better than the other close approaches it makes every 26 months. Earth is closer to the Sun, so it effectively passes Mars every 26 months as both worlds orbit the central star. Mars will be 43,137,071 miles (69,422,386 kilometers) from Earth at around 11:25 p.m. ET Saturday. In truth, the view will be basically the same as the night before and the night after. But the event is being marked by star parties in many communities. Sherrod said the dust storm is not currently visible during nighttime hours from Europe or Australia. Mars is a fuzzy orange point of light in the late evening sky now, in the East. In the predawn, it looms in the western sky. Small telescopes will reveal Mars as a disk, rather than a point of light. Good-sized backyard telescopes, generally about 3 inches or larger, show details of the planet's surface. NASA's Mars rover Opportunity, currently exploring the Meridiani Planum, has seen some signs of the dust storm, which is apparently nearby. "This may be the second biggest dust storm that Opportunity has seen," Mark Lemmon, a rover science team member from Texas A&M University, told SPACE.com, adding that he has seen the images taken by Sherrod. "I'd seen those this morning and I waited very impatiently for the rover's downlink to come in." Lemmon said that data returned to Earth Friday by Opportunity showed elevated dust levels at Meridiani Planum, which were measured at an optical depth of about 1.4. The largest dust storm experienced by the rover occurred in June and rated an optical depth of about 2, he added. For comparison, a smoggy day in Los Angeles would rate an optical depth of about 1.0, and moderate days on Mars are about 0.5, NASA officials said. Martian dust storms blot out sunlight from rover panels, but otherwise are relatively harmless to the robotic explorers, Lemmon said. While dust storm activity in Opportunity's region of Mars is winding down, team members with NASA's Mars Global Surveyor orbiters noticed a rise in activity about two weeks ago, Lemmon said, adding that researchers are not sure how large the current storm could grow. "We started seeing more and more dusting on the solar panels," he added. "And we have indirect evidence that these storms are windy. We've seen material blown out of the rover tracks over the last two weeks." Lemmon suspects that Opportunity experienced one of the "fingers" of the storm photographed by Sherrod, adding that later atmospheric measurements were lower than the 1.4 optical depth seen earlier, but not quite at the moderate 0.5. "Because we got the warning that something was happening...we were able to get in some atmospheric observations in," Lemmon said. "So if this does give us a direct hit over the rover, we're ready." Lemmon said he and other researchers are eager to learn the properties of the dust within the storm and compare it to the material Opportunity sees daily. Meanwhile, Opportunity's robotic twin Spirit has found some signs of additional atmospheric dust at its Gusev Crater landing site on the other side of Mars. Lemmon said Spirit detected an optical depth of about 0.6, still well within the moderate range, but would likely not experience as significant an increase in dust levels as Opportunity. SPACE.com's Tariq Malik contributed to this report.